The hallmark of our liberal republic is the federal congressional presidency established by the Constitution as a replacement to the Articles of Confederation. The Founders did not completely agree over how the new government should have looked like. Although the consensus at the Constitutional Convention was that there ought to be a distinct legislative and executive branch in order to maintain a separation of powers and divided government to prevent “factions” or dominant interest groups and political parties from emerging; they were dead wrong. The founders intentions began to fail immediately after the new government was formed. Two main parties emerged, the Federalists and Democrat Republicans; marking the beginning of Americas two party system (aside from the brief one part system in the 1820s). And it shouldn’t have been unexpected either. The single member district voting method the founders adopted naturally encourages strategic voting leading to a two party system. The American people are loud and clear when it comes to their view of our two major parties; 57 percent, of those surveyed in Gallup’s annual governance poll say a third major political party should exist. 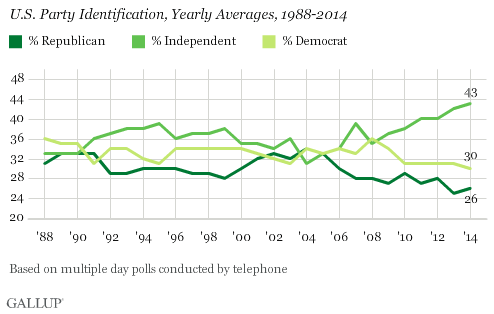 Only 37 percent believe two parties are doing just fine representing Americans. This duopoly forces voters to choose between lesser of two evils. Their views are many times not accurately represented in congress and the parties have little to no incentive to implement reforms many Americans would like to see but would leave the parties with less power. Under the presidency of Andrew Jackson, the founders system took another toll as party elites and servants close to them created a system of a patronage known as the spoils system. Not only were factions controlling our government but they were leeching off taxpayers while doing it. There were many notorious cases of elected officials handing out jobs in the civil service to party supporters, regardless of qualifications. It took the death of a president, James Garfield, in 1881 by a rejected office seeker in order for much need reform to be enacted. Even then, the patron-client system has not disappeared; the spoils system was only replaced by the political machine we have now. Many like to argue that the president is necessary to maintain balance and separation of powers in our government. But there’s serious skepticism that that’s the case. First of all, the president has no choice to bend to the will of congress if he wants to fulfill his mandate. Sitting congressmen enjoy a strong incumbent advantage; 97 percent of Representatives and 87 percent of Senators won their reelection in 2016. Presidents don’t enjoy the same amount of job security, as such they have a lot more to lose. And to make matters worse; a super-majority of Americans are dissatisfied with congress as only 19% of voters approve of congress. And these low numbers are not surprising (except during times of national crisis), 2014 saw a record low of a 9 percent approval rating. Instead of taking out their disenchantment against their congressmen, they will 9 out of 10 times re-elect the problem, and instead put most of the blame on the president for not fulfilling their promises even though they have no legislative power whatsoever to whip congress or introduce legislation. The presidency has been nothing but a scapegoat for congress. We’ve identified what the problems are but we should remind ourselves of what the founders got right: A federal bicameral legislature and an independent judiciary. I’m not contending that we should adopt the unitary sovereign parliament of the UK (Technically it is bicameral but the upper house is nothing more than a rubber stamp and has been overridden by the house of commons with a simple majority whenever they have tried to reject legislation). The core principles of American democracy has always been federalism and constitutionalism, and this should not change. Instead of our current single member, winner takes all system; the apportionment of legislators to the lower house of parliament would be selected by a Mixed Member Proportional system. They way it works is that voters elect one candidate to represent their district but also vote on a separate for a party. District winners are given their seats first and thereafter, the party votes are added up and the parties are allocated seats proportional to their share of the vote. This gets rid of strategic voting as the people can now vote for people and parties they feel best represent them. In every government there is a head of state and head of government. The former is in charge of foreign affairs, head of the armed forces, and appoints major office holders. The head of state is supposed to be the person that is above politics, a statesmen; and is generally unelected or at least indirectly elected by the people. The head of government meanwhile is supposed to represent the commons. They are in charge of enforcing laws, managing the bureaucracy, setting the budget, and working with cabinet officials. Often times, such as in our case, the head of state is also the head of government. Under an American Dual executive, the President of the Senate (a seat held by the Vice President of the United States) would be the head of state and the leader of the majority or coalition party of the Senate. Likewise the Speaker of the House (maybe rename it to “Chancellor”) would be the head of government. The parliamentary part of the dual executive would make it so that the Chancellor and President are selected by the majority party or coalition of the House and Senate respectively. Our current legislature somewhat reflects the jobs that heads of government and heads of states are in charge of carrying out. Senators were originally chosen by state legislatures so that there was a balance against the popular will of the people represented by the house of representatives who were elected directly (As an added bonus, we should repeal the 16th amendment as well to restore vertical federalism). The Senate also handles diplomacy and foreign affairs as they are the only ones who can declare war and approve treaties. The House on the other hand gets to privilege of having all bills of revenue originate with them and they take the lead in setting the budget. In the end of course, both chambers of parliament will need to approve of a bill in order for it to become law but there would be no override vote by either. I contend that this whole system would be a lot more appealing to small government conservatives and libertarians as well. As proponents of government that does less, this would not only enhance the power struggle between the Senate and the House but also causes friction within the various competing parties within the respective chambers of parliament causing a more divided government unable to pass much legislation. This plurality of interests would thus fulfill Madison’s’ goal of preventing elite factions from exploiting the government. 1. I never said it makes them immune of criticism but rather that they did understand that as time goes on perspective will change. 2. I would generally agree but it’s not false that we do still have third parties. I would say it’s more because of the first past the post system, which if you want to debate I’m fine with, which makes it so two parties are only seriously competitive. 3. When did I say that by following Hobbes you’re automatically right? I don’t even agree with Hobbes on many things, as you know, so that’d be absurd. I’m addressing your point of saying that’s a product of the system and rather showing it’s something they wanted. Now, most people fear this but is it really warranted? In most cases I would say that it is in fact not. This ties into other parts of the Constitution which are to make sure populist uprisings are contained. 4. I will concede that fringe parties are a possibile result of the two party system although many multi party countries in Europe have fringe parties too. In regards to the main point, for one I wouldn’t be surprised if a centrist candidate ran today he couldn’t get some support. Ross Perot (you can call him a centrist or a populist but he isn’t fringe for sure) ran and got over 10% of the vote twice, which is what most of the European parties that finish third do. I wouldn’t say it’s impossible but that undesirable. If a centrist candidate is the true desire then I think we’ve already seen that. The whole point of the parties is that they are big tent organizations. Sometimes they do nominate moderates or just full on centrists. It allows candidates to appeal to the mass spectrum in a big tent. I don’t see what’s wrong with that. 5. Well in any government it’s possible. Look at Fillon in France. How is what he did not patronage? It’s not something that is just an American phenomenon. The only thing we can do is elect better people who have better interests. 6. You do need checks and balances to ensure freedom and accountability. Firstly, this is necessary to make sure that rights of the people are kept out of the hands of political decisions, in particular for minorities. Hence why we have a judiciary that is independent. Then the executive and the bicameral legislature are to make sure that laws are carried out in effective manner but are also separated from the people who make them. Secondly, I want to address your stats. On the democracy index I find many flaws. Two things it measures that definitely influence the score such as voter participation and functioning of government which are absurd to declare that the virtue of a democracy, in this sense. For one, voter turnout is something that little can be done to help with. Just because less people participate in US elections doesn’t mean we are less free or less of a democracy. That’s the people’s choice and you can’t force people to vote. I’m functioning of government I see a major flaw. I couldn’t find any particular definition but I imagine it’s based on legislation and progress. Yes, that’s obvious. However, this is a good thing. A reason our system aims for less laws is that more decisions should be up to the people not to politicians. You can’t claim to oppose corruption and then want more power in the hands of few. Next, less laws are passed because of the way each chamber is set up. The whole point of the 60 vote threshold is to make sure that a consensus can be reached amongst people before laws go into place. I don’t understand how you can claim to support individual freedom and liberty and then want a majority to be dictating laws and rules to the minority without any consultation. Lastly, economic freedom isn’t the only kind of freedom. There is political and individual freedom too and those are more important in regards to something like a constitution. Economic Freedom ultimately has more to do with the people we elect. Not how we elect them. I explicitly said the first past the post system is what causes two major parties to dominate. Single member district and FPTP are practically synonymous with each other. Regardless you did misinterpret Hobbes. The lesser of two evils has nothing to do with political parties; he was talking about leaving he state of nature in exchange for state violence. But what is undeniably true is that they did not want powerful factions to arise (which have). Ross Perot also became a reason why not to vote for centrist third party candidates. Strategic voting disincentives voting outside the mainstream because that 10% means nothing if you don’t get any representation. And it’s also not true that many times our political parties nominate moderate or centrist candidates. Its the opposite quite often, many political scientists will tell you that party elites are far more right or left than their party members and thus more partisan candidates are nominated. Of course they’ll try to act moderate to appeal the center base but we all know there’s empty meaning behind them. I don’t see why parties are supposed to be big tent, that is just arbitrary essentialism. It was not patronage actually, it was nepotism. Clear difference. But while it could be possible, it is not as prevalent due to the plurality of interests that watchdog each other. Not necessarily although I would prefer some checks and balances. I did explicitly argue for vertical federalism and independent judiciary, those two things have become customary in our political culture that it does not make much sense to take them away. But the United Kingdom easily proves that you don’t “need” any of that. There is neither an independent judiciary or a check on the house of commons. Parliament is sovereign yet liberty is still high. But to reiterate, that’s not what I’m arguing for here. I simply said that an independent executive was not necessary to ensure liberty. But more importantly, having one has distracted voters from the real problem which is congress. Reread what I said, my main point is that is makes more attentive to the actions of their representatives in the legislator who they themselves have acknowledge is the bigger problem. Well again I already point out that they do rank higher than the United States in political freedom alone soooo… Let’s look at CATO’s freedom index which combines the two. 2nd) Switzerland 3rd) New Zealand 6) Canada, Australia, and the United Kingdom (tied), and 23rd) United States… Again no evidence that a parliamentary democracy is less deterrent to liberty than a congressional presidency. I didn’t even mention the other parliamentary democracies that rank higher than the US either. And more bolstering to my point, New Zealand has a Mixed Member Proportional Parliamentary system which is comes closest to the system I’m arguing for and they rank 3rd. I’m not going to go into your reform proposals but I will address your complaints with the founders system. Firstly, we have an amendment system. No Founding Father ever said the Constitution was a perfect system, hence a more perfect union. Now, in regards to your points. For one, we have third parties and during pre civil war times there had been pretty powerful third parties such as American Nativist Party and Free Soil. Also, you say lesser of two evils like it’s a bad thing. Many of the Founders who were influential in the constitution were very much so influenced by Hobbes and as we know he is very much associated with the lesser of two evils point of view, so it’s not a flaw but rather a created part of the system. Lastly, the three largest third parties are Constitution, Libertarian, and Green. All of these parties the same argument could be made on. Most Americans don’t support the immigration policies of the Constitution, the economic policies of the the libertarian party, or the majority of what the greens propose. So even with them in power lesser of two evils is still relevant. On the patronage or spoils system I don’t think you can attribute that with the founders. Andrew Jackson was in no way a founding father and almost everything he believed was contrary to the views of many founders. So that can’t be logically associated with them. Finally, you say a problem is the executive not being able to fulfill his mandate because of congress. That’s the whole point, congress is an independent body which doesn’t have to cooperate with the executive. They both have checks on each branch, this is to ensure liberty and stop corruption. We elect a president not a dictator or supreme leader. I’m not ignorant of that, this isn’t a criticism of the constitution as a whole but Article1 and 2 specifically. Also how does the Founders anticipating criticism make them immune from it? Those two parties were far more prominent at the local level than at the federal level. They had one good year and that was during the 1852 election but they immediately collapsed in the following election. The only time we’ve had an actual competitive third party was the GOP and it was only because it came about as a splinter of Northern Whigs that opposed slavery against Southern Whigs (who eventually join the Democrat Party) that supported it. It’s very rare such deep dividing issues will come about again. And again as soon as the GOP rose, the Whig Party collapsed; maintaining a two party equilibrium. It is a bad thing if you care about political efficacy. Saying that the founders were just following Hobbes said is an appeal to authority; it does not take away that the lesser of two evils is a serious problem. Many citizens distrust the government, the media, and other important institutions which is no surprise that dangerous populists like Sanders and Trump who’ve spoken out against this have emerged. These parties exist under a two party system, as a result they appeal to voters who are completely out of the mainstream from the top two and general voters as well. They’re fringe in other words. But I have no reason to doubt why a centrist or moderate would not be able to emerge under a multiparty system or at least have the current main parties move closer to the center. Obviously there will never a be party that will appeal to every voters single issue but it does come closer than the catch-all system we have now. If I create something susceptible to corruption am I not least partly culpable? They didn’t create the spoils system but they did leave the opportunity for it to come about. Further those same countries rank higher than the US in the economic freedom index, so there’s absolutely no empirical evidence that our three branch system is necessary to ensure liberty or prevent corruption.